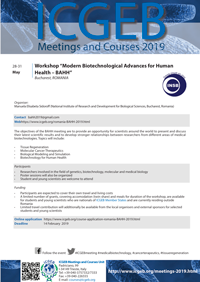 ICGEB Workshop “Modern Biotechnological Advances for Human Health – BAHH”, organized in Romania, Bucharest, is dedicated to the dissemination of the advances in the field of biotechnologies for human health that can significantly improve the quality of life. The objectives of the BAHH scientific event are to provide an opportunity for scientists around the world to present and discuss their latest scientific results and to develop stronger relationships between researchers from different areas of medical biotechnologies. Registrations will be made through the workshop web site (http://www.incdsb.ro/p/bahh2019/) that will be available in due time. A limited number of scholarships (10 young scientists) will be awarded under the ICGEB Regulation. Scholarship applications will be available on the ICGEB website of the event http://www.icgeb.org/romania-BAHH-2019.html . The workshop consists of keynote speakers’ presentations, oral presentations and a posters session. An optional field trip will be organized at the Cantacuzino Castel from Busteni of Prahova County and a Romanian wine tasting at the Halewood (Azuga) RHEIN&CIE wine cellars. The accommodation will be in a hotel located in Bucharest downtown. Information and rates will be listed on the scientific event web site. For participants who need visa to enter in Romania, required official documents will be provided through local organizing committee (bahh.2019@gmail.com), upon request.